The dog in the house produces scratches on the wood door by their claws and sharp nails. You must be disliking the scratches which your pet develops due to restlessness while getting in and out. As the pet owner, you can train your pooch so that your wood doors remain free from scratches. But if they already made scratches on the wood door then you have to get it repaired. 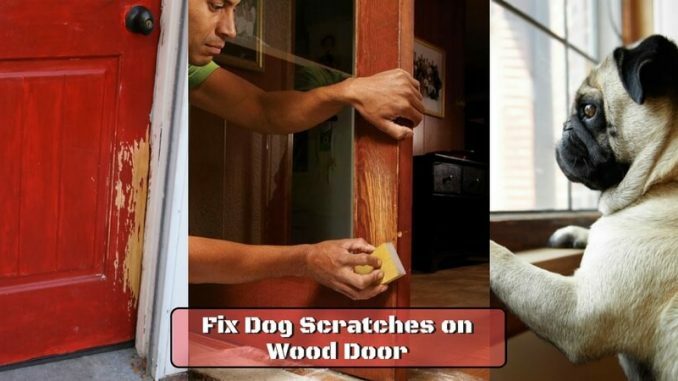 If you are looking for the ways to protect the door from dog scratch, then here you will get appropriate guidance on the same. Let’s move further to explore the guidelines so that you can reestablish the magnificence of your wood door. How to repair dog scratches on the wood door? If your pooch has developed light scratches, then you can make use of steel wool made up of excellent material. Now rub the affected with the steel wool. Make use of sandpaper to scratch the deep marks which can be performed by hand or employ orbital sander. Scraping with hands will provide you better control over the damaged area. Apply the solution of mineral spirit (the mixture of petroleum and thinner) over the scraped area. Then use the wood filler which you can get it from the market. Wait for some time so that the wood filler gets dried and after that sand the area in the lighter manner which will allow you to remove dust. Ensure you properly clean the sanded area with a tack cloth. After cleaning, you can put on the color over the affected area. Finally, allow it to dry. Meanwhile, you have to keep the door open so that your renovating work is carried out smoothly. From the points as mentioned above, you can repair dog scratches on the door. By following these ways, you can efficiently deal with dog scratches door repair task. Whatever type of scratch whether light or heavy both can be treated efficiently by taking on the ways discussed in this article. Don’t you think if you stop your pet from scratching the door then you don’t have to work on repairing the damaged door? It would be great for you if you protect the door from the dog scratch. Here I will let you know in what manner you work on the same. How to stop dog from scratching door? First of all, you can install a pet door from which your dear pet can enter or exit. Put in doorbells or jingle bells which should be approachable to your pooch. Motivate your loving pet to make use of these sounds. Apply “no scratch” door guards to save the doors. On and around the door you can also make use of no-scratch sprays and repellent. Inside of the door, you can make use of baby gate or couch and outside lawn chair which will act as the temporary barrier. Now away from the door, you can train your pet as regards how to make use of the door. Make sure that you check the scratching and barking habit of your pooch from the starting so that he develops the practice in a disciplined manner. Determinedly say ‘No’ to your pooch if he shows unwanted behavior. Teach him good habits so that he learns accordingly. Offer him treats when he shows preferable behavior. Heavy-duty dog door will be helpful to save your entry from marks. You will find it easy to install and weather resistant. Train good habits in your pooch. Take no notice of unwanted behavior so that your pet can learn that his master will not entertain the undesirable activities. All these points mentioned above will control your pet’s habit of scratching the door which in turn protect door from dog scratch. In this way, you can maintain the beauty of your door and save your time and energy from repairing the dog scratches on the door. Best Weatherproof Dog Door | Buy Weather Seal Doors Now!